There have always been a lot of questions when the idea of a tension fabric exhibits is brought up during a discovery meeting with a potential or current client. The question of whether the idea is a viable way to exhibit at any particular show especially when the exhibit is on the larger side? Will it look good? Some of the inevitable first comments, and strong opinions I typically hear focus on the lack of accessories or wrinkles…It always seems that the “wrinkled” fabric comes up in any conversation in just a few moments. 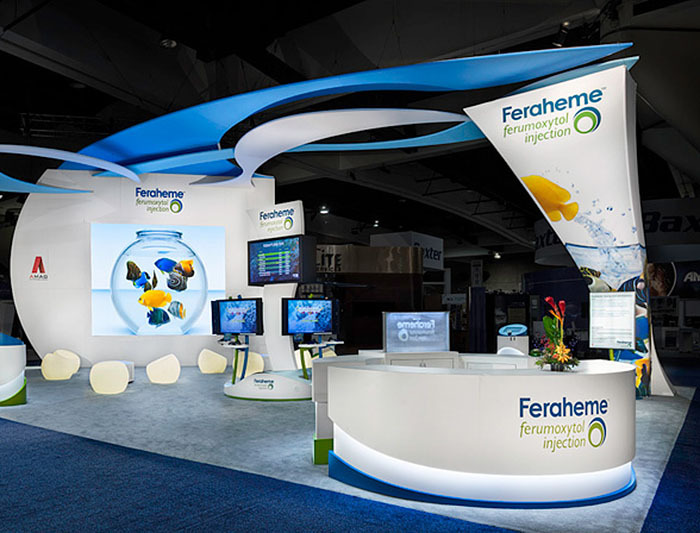 So let us dig in and and take a look at these tension fabric exhibit platforms from a neutral stance and really get to know the strengths and weaknesses of these very flexible booth structures. 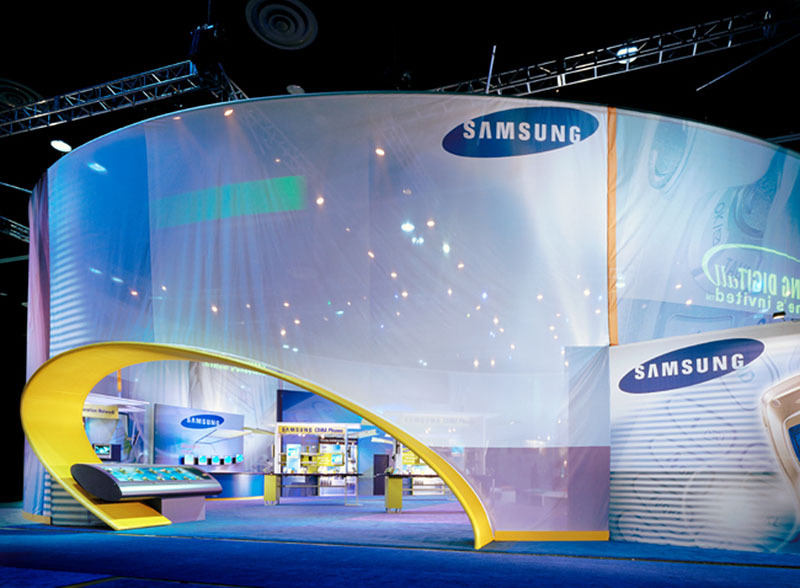 Hopefully this will open your mind and let you start imagining the possibilities these dynamic tension fabric structures could have on your next event or upcoming trade show. 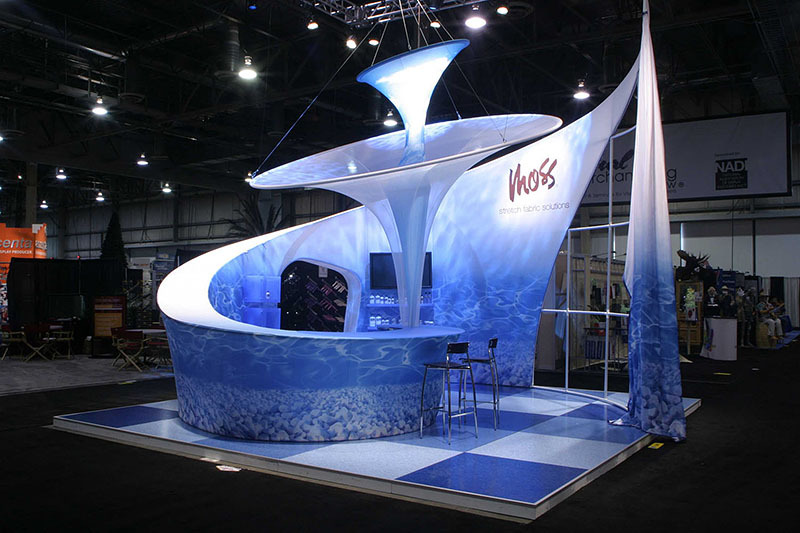 You can imagine the popularity of tension fabric exhibits options has grown over the last 10 years by leaps and bounds and along with the interest in these fabric structures, the diversity and quality of the fabrics has grown as well. Where once we had the option of just a simple cotton fabric, we now have some very flexible spandex blends that help eliminate the dreaded wrinkles but also can hold a high-quality San Francisco trade show booth design without looking washed out. 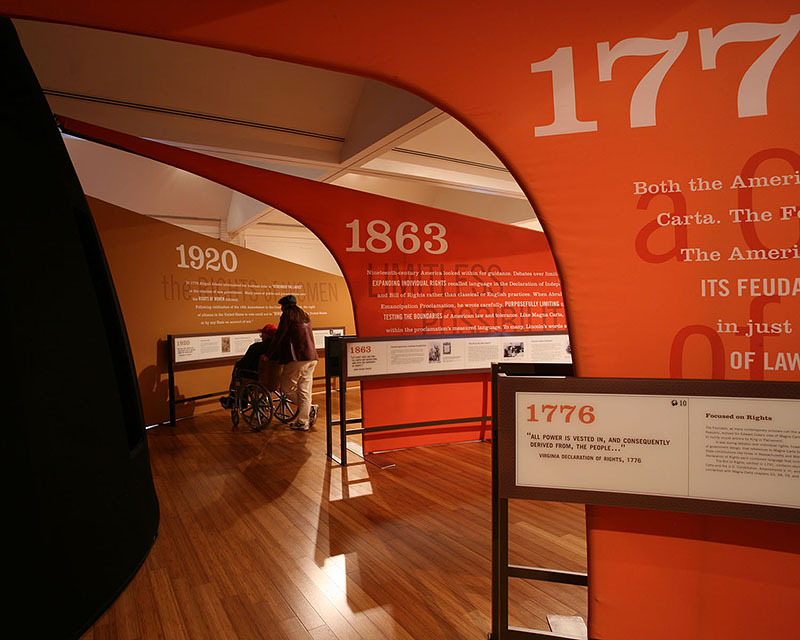 Some strengths of the modern day tension fabric exhibit is that they have a nearly unlimited amount of materials to utilize; from block-out materials to elegant and translucent scrim. Most of these materials have levels of stretch to accommodate the structure they are used on. Very flexible materials will have less chance of wrinkles however on the flip side very heavy weight and block-out style of material sometimes need some time to relax when unpacked. The reduction in shipping drayage fees are a huge reason why many exhibitors are interested in moving towards the versatile tension fabric structures. What once would take 10 coffin crates now takes one, and cost saving can be huge. Fabrics fold or roll into very small and tight spaces adding a soft barrier between other parts. They also tend to survive most fork lift incidents that do occasionally happen when they are being unloaded for show or packed to head back to your warehouse. One of the small downsides to fabric graphics are If they get dirty it can be distracting during the show, however the bright side is that many are machine washable and look as good as new once cleaned. Always request proper cleaning instructions from your exhibit house. That is correct, you can assemble many full size exhibits without the use of a single tool and that can save you time and money on labor. Hanging signs are a prime example of a common tension fabric exhibit structure that just clicks together and is then is ready to be put into place by the venue labor staff. Many other structural elements work in the same way with the aluminum tube with locking ends that simply click into position. The graphics are then just slid onto the framework and zipped together at a point the is usually too high or low for anyone to see creating a seamless and visually stunning structure. You can view really creative examples until the cows come home of the web these days. Tension fabric exhibits are truly amazing and the only obstacle is the imagination of your team and the exhibit house you are working with. Here are some of the better examples we have seen over the years. 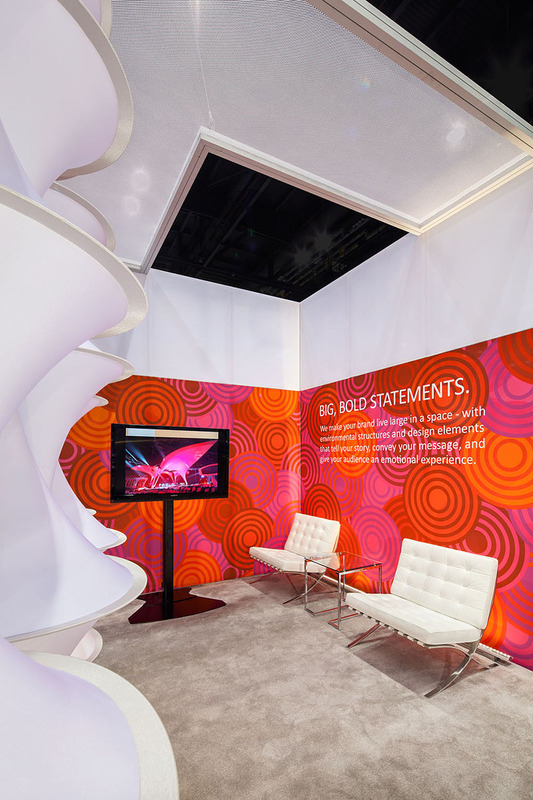 These tension fabric exhibits are inspiring and eye catching to say the least! 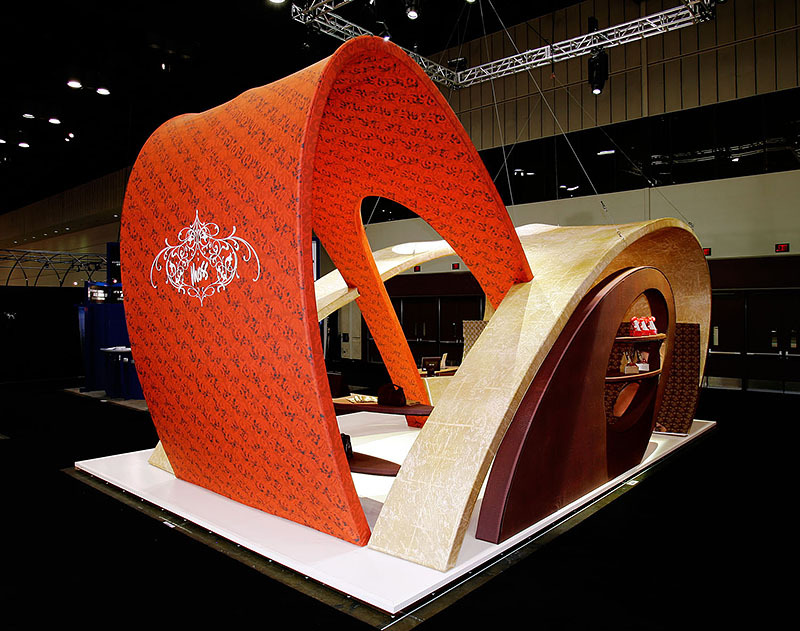 We encourage everyone to entertain the idea of using tension fabrics for your next trade show platform. 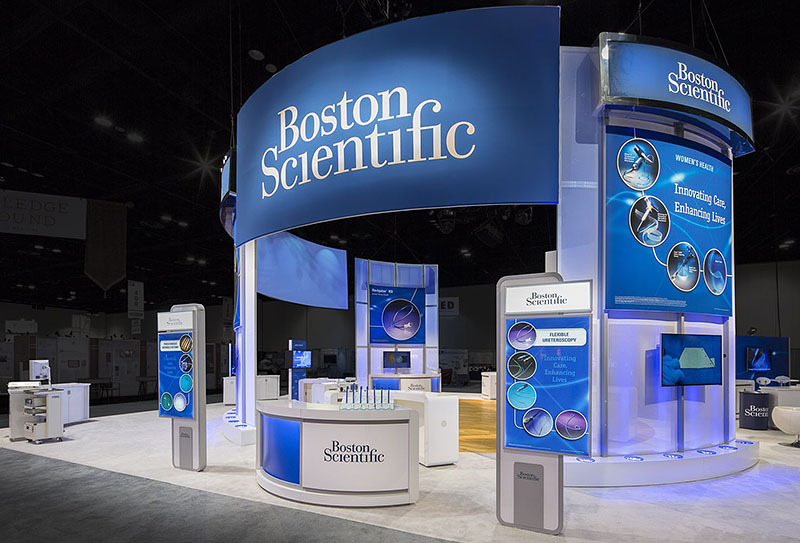 We will be posting more information on how tension fabric exhibits can be used for road shows and kiosks as well to great effect! Please contact your Blazer Exhibits sales representative for more information on these amazing and seemingly limitless trade show display option!